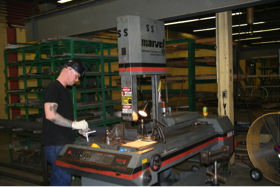 Since its start as a small custom metal fabrication shop in support of AME's equipment and rigging efforts, the Fabrication Division of AME has grown immensely. This growth has been carefully controlled so that our core principles of quality workmanship and customer service would be maintained as the division grew. This is evidenced by the fact that our largest customer is also one of our oldest at over 35 years. This does not happen by accident. It is because of quality and good client relationships. These are old lessons learned that must be maintained and brought forward as we grow.